I bought this postcard a while ago on eBay. What prompted me was the eye-catching structure on the left, the Queens Cinematograph – a fairground ‘bioscope’, or travelling film show. The bioscope show was a fixture (if that’s the right word to use for such a nomadic form of entertainment) of fairgrounds from at least 1897, the year that the showman Randall Williams kitted out his touring ‘ghost show’ for film projection. 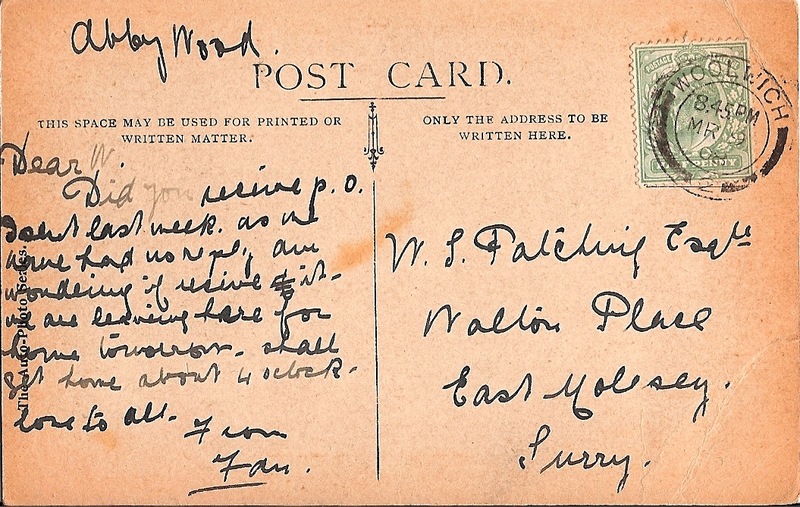 By March 1908, when this postcard was sent, bioscope shows were no longer strictly a novelty. The people gathering round the Queens Cinematograph in the picture could well have visited one before. In fact, on closer inspection, the image might even reveal another bioscope show to the right-hand side – Biddall being the name of a rival bioscope family. Did visitors to Hampstead Heath in 1908 have a choice of film shows to go to? We don’t get much of a sense of what it was like to attend a fairground bioscope show from this postcard – that is, of what went on inside the decorated booth. But we do get a snapshot of how film shows could fit into the texture of Edwardian life and leisure. Hampstead Heath has a long history of popular entertainments. In the late nineteenth century, visitors to Hampstead Heath Fair could enjoy (writes Alan Farmer) their choice of ‘coconut shies, stereoscopes, skipping ropes, sweetmeat vendors, silhouette artists, and a machine with a “galvanic battery” which gave an electric shock’, plus the more low-tech pleasures of donkey rides and dances. A bioscope show like Queens Cinematograph would have arrived into a busy but expanding marketplace. In the 1880s, about 100,000 Londoners – and by 1910 about 300,000 – could be relied upon to visit the Heath on a Bank Holiday. Some of the people captured in this postcard image are busy inspecting and enjoying the commercial entertainments on offer. Others seem more interested in simply taking a stroll, or, in the case of one woman framed a little below the bustle of the bioscope show, catching the eye of whoever is taking the photograph. I particularly like the woman in the bottom right-hand corner with her back to the crowds, who’s been caught looking quizzically at something (or someone) out of shot. Did you receive p. o. I sent last week. as we have had no reply am wondering if receive it. we are leaving here for home tomorrow. shall get home about 4 oclock. What thoughts or memories the Queens Cinematograph conjured up for the writer (and whether W. ever got his postal order) remains a mystery. There’s more about early bioscope shows in Vanessa Toulmin’s 1994 article ‘Telling the Tale: The Story of the Fairground Bioscope Shows and the Showmen Who Operated Them’, in the journal of Film History. Alan Farmer’s book Hampstead Heath (New Barnet, Herts: Historical Publications, 1984) goes into detail about the area’s place in nineteenth-century popular culture. The Who’s Who of Victorian Cinema website gives a profile of Randall Williams and his travelling cinematograph show. Postcards like this are such a brilliant, if rather myopic, snapshot of the fairground cinematograph show in situ. Taken during the day you can only wonder how different it was at night. The limitations on most photography of the time means we’re unlikely to see a good nighttime comparison, but the daytime crowd is quite telling in its way. Thanks, Pete! I’ll try to track down a copy. Speaking of nighttime images of travelling cinema shows, I came across an article in The Cinema the other day which showed exactly that, although it wasn’t in a fairground context. This was for the Coronation Cinema Car, which was designed to tour the country showing advertising films. You should be able to see it on the Internet Archive here. Nowhere near as glitzy as the fairground bioscopes, mind.